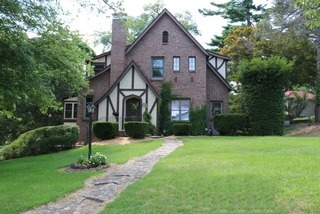 20 Cascade Terrace, Burlington, IA – Incredibly well maintained Tudor home nestled among the trees in a fantastic neighborhood. BIDDING ENDS THURSDAY, AUGUST 23RD, 2018 at 1:00 P.M.
Open House/ Inspection: Sunday, August 12th from 11:00 A.M. – 1:00 P.M.
Beautiful home nestled among the trees! Awesome location with views of the Cascade Bridge and local wildlife. This immaculate Tudor home features oak floors, crown molding and great attention to detail. Spacious living and dining areas, a wood burning fireplace, kitchen with breakfast nook and a beautiful sun room make this home warm and inviting. It also boasts 3 bedrooms and 1 ½ baths, along with an attached garage. Incredibly well maintained, the home sells complete with newer appliances, high efficiency furnace with central air, newer water heater and more. Auctioneer’s Note: If you are looking for a meticulously maintained property, then look no further. We strongly encourage all interested parties to attend the open house or schedule a private showing. This Auction will be conducted Online Only, whereas each bidder can conveniently bid with an electronic device from anywhere! Broker participation Invited – contact any licensed real estate agent to see this awesome property! Terms: $10,000 earnest money deposit due at the end of the auction with the remainder due on or before September 24th, 2018. The seller will provide a current abstract at their expense. Real Estate sells “as is, where is”. Sale is not contingent on Buyer’s financing or any other contingencies. Seller reserves the right to accept or reject the high bid. Closing: Closing will take place on or before September 24th, 2018. The balance of the purchase price will be payable at closing by guaranteed check or wire transfer.